…and can change you too. 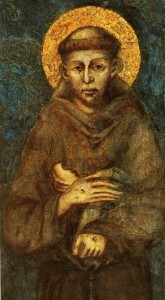 One of the things that makes St Francis so popular is that he was so utterly and completely converted. He was rooted and engrafted into Christ through several remarkable events that transformed him from the inside out. It is this profound and radical encounter with Christ that can also transform us. We may not have the same experiences that St Francis had, but the essence of his total conversion is what each one of us must experience within our own context and our own particular lives. 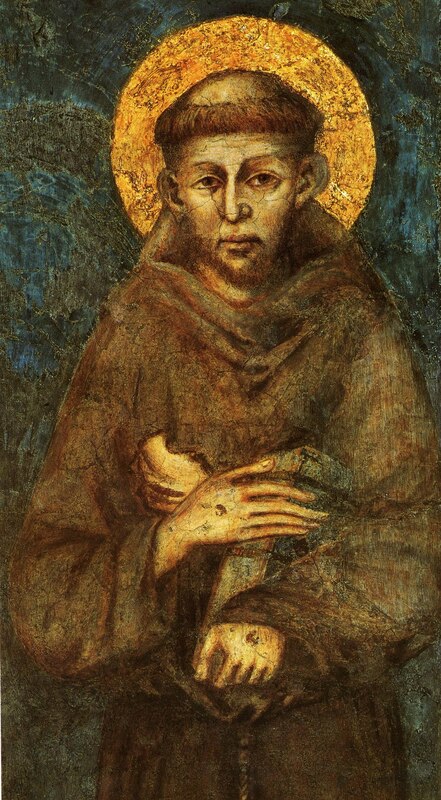 Following Christ in the way of St Francis is possible for lay people through the secular Franciscans. You can check out their website here. Francis Rejected Worldliness – As a young man he went off to war, was taken prisoner, came home and still continued to pursue a life of pleasure and fun. But then through his experience as a prisoner of war and through sickness he re-evaluated his life and turned away from the shallow pursuit of pleasure. Worldliness is our default setting: we think life is all about the pursuit of pleasure, prosperity, peace, prestige and passion. For conversion to take place, like Francis, we have to see through all that. We have to see that it is fleeting. It doesn’t mean we reject the good things of life because they are bad, but because there is something better: the treasures of heaven. Francis Married Lady Poverty – As part of his rejection of worldliness, Francis openly embraced poverty. He begged for alms outside St Peter’s and finally took a vow of complete poverty. In an age where wealth was considered a blessing and poverty a curse, to embrace poverty was a radically prophetic sign. Is our age any different? Prosperity gospel preachers teach that wealth is a blessing and poverty a curse. To follow St Francis we do not need to embrace radical poverty, but we do need to exercise detachment from our possessions. This is where St Benedict balances Francis. The Benedictine Way teaches that property is not evil, but the monk follows personal poverty in not owning anything personally and thus being detached. We can do this by being free with our possessions and cultivating a radical generosity. Francis Kissed the Lepers – Francis’ radical conversion took him to minister to the poor and needy. In kissing the lepers he took the love of Christ to the most excluded, despised and deformed of God’s children. True conversion cannot happen unless we do Christ’s work reaching out to those in need. Even in a small way we can reach out to the lonely old person, the neglected child, the hungry person and the homeless. True conversion takes place as we see Christ in them and they see Christ in us ministering. Francis Stripped Naked – Conversion means becoming a child again. Francis’ famous stripping episode was a deeply prophetic symbolic act. It was a sign of his being born again. He was not so much rejecting his father as accepting his heavenly father. Being clothed in nothing but the love of Christ he was naked as a newborn. We don’t need to follow Francis literally (thank heaven!) but we do need to be born again (Jn 3). We need to be brought to that moment when we realize we have nothing but Christ and rely on nothing but Christ. If we have not approached that total understanding of our need for grace, then we are still searching. If we ask to be born again we will be granted that moment. But be careful what your pray for. You might get it!